Is It OK to Drink Tazo Calm Tea While Pregnant? If you are pregnant, you are likely aware that it is essential to get the proper daily nutrition for your changing body and developing baby. It is also important to avoid or limit foods that may be harmful during pregnancy. This includes tea, primarily because of its caffeine content. However, even herbal teas that do not contain caffeine, such as Tazo Calm Tea, contain ingredients that are not proven to be safe to the developing baby and should be avoided by pregnant women. Doctors recommend that you avoid or limit tea during pregnancy because many types of tea contain caffeine. Even some herbal infusions may have small amounts of green or blacks teas, which contain caffeine. The BabyCenter website advises that you do not have to completely abstain from caffeine, but you may have to cut down on your tea consumption if you drink more than two mugs a day. Although tea contains less caffeine than coffee, it only takes two mugs of tea to provide 200 milligrams of caffeine. The American Pregnancy Association warns that caffeine is absorbed into the mother's bloodstream and crosses the placenta, where it reaches the baby. The developing fetus is not able to break down caffeine and it may build up in the fetus's bloodstream. Caffeine is a stimulant, and just as it can make you feel more awake and increase your heart rate and metabolism, it can also make your baby feel restless. A more serious issue is that having too much caffeine regularly while you are pregnant can increase the risk of a low birth weight and even the risk of a miscarriage. Herbal teas, such as Tazo Calm Tea, are naturally free of caffeine. However, the BabyCenter website warns that herbal teas should not be considered safe during pregnancy, because they may contain herbs that have unknown effects on developing babies. Though herbs are generally considered to have healthful properties, they can also cause adverse effects, just as other drugs do, in both pregnant and nonpregnant individuals. In addition, many herbal teas contain a variety of ingredients to add flavor and specific qualities to the tea. Except for single herb teas, it may be difficult to find an infusion that contains only herbs that are proven to be safe for pregnant women to drink. TeaDiscussion.com lists the following herbal ingredients in Tazo's Calm Herbal Tea infusion: chamomile blossoms, spearmint leaves, hibiscus flowers, blackberry leaves, rose petals, peppermint leaves, safflower, lemon balm, lemon grass and other natural flavorings. Chamomile is commonly found in teas that are marketed as calming because it has mild sedating properties to induce relaxation and sleep. However, the American Pregnancy Association advises that because there is insufficient research on this calming herb, it cannot be considered safe for pregnant women. There is also not enough known about the effects of hibiscus flowers, blackberry leaves, rose petals, safflower and lemon grass on the developing baby. Without question, it is always important to be extra cautious and avoid anything that may be potentially harmful to you or your developing baby. The American Pregnancy Association notes that peppermint leaf and lemon balm are "likely safe" during pregnancy. Hence, herbal teas that contain these and other safe ingredients alone may be consumed during pregnancy. 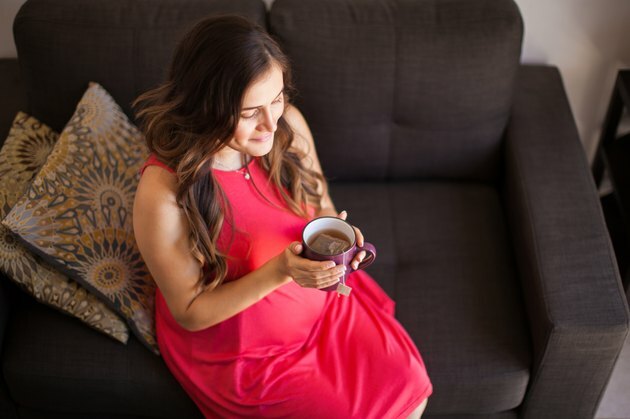 BabyCenter: Caffeine and Pregnancy: What's Safe?